"Elks" redirects here. For the animal, see Elk. For the Canadian counterpart see, see Elks of Canada. For other uses, see Elks (disambiguation). The Benevolent and Protective Order of Elks (BPOE; also often known as the Elks Lodge or simply The Elks) is an American fraternal order founded in 1868 originally as a social club in New York City. Membership was originally restricted to white men, but the organization now has a more inclusive membership policy. The Elks had modest beginnings in 1868 as a social club for minstrel show performers, called the "Jolly Corks". It was established as a private club to elude New York City laws governing the opening hours of public taverns. The Elks borrowed rituals and practices from Freemasonry, including racial restrictions on membership. The BPOE was originally an all-white organization. In the early 1970s this policy led the Order into conflict with the courts over its refusal to allow African Americans the use of its club and leisure activities. In nearly all instances, the all-whites clause was made public after someone was denied the use of the Elks' dining or leisure facilities. The clause was revoked at the Grand Lodge of 1976, with the proviso that it could be reinstated if the law allowed. In 1919 a "Flag Day resolution" was passed, barring membership to even passive sympathizers "of the Bolsheviki, Anarchists, the I.W.W., or kindred organizations, or who does not give undivided allegiance to" the flag and constitution of the United States. In 1979 the qualifications for membership included being male, at least 21 years old, of sound mind and body, a citizen of the United States and not a member of the Communist Party. Belief in a Supreme Being has been a prerequisite for membership since 1892. The word "God" was substituted for Supreme Being in 1946. The current requirements include a belief in God, American citizenship, good moral character and being over 21. There is also a background interview conducted by the Membership Committee, who make the final recommendation to the Lodge members. The members then use a ballot box, with the back drawer first being displayed to the members to be empty, then the members dropping one at a time into the hole in the back their vote, typically a white glass marble to accept or a black lead cube to reject, with a 2/3 majority of members present necessary to be accepted. All members present are required to cast a ballot (no abstaining is allowed), and the loud knocking sound of each ballot being dropped through the back hole into the voting drawer both indicates to the other members that the current member is not abstaining from voting but has cast their ballot, while also making sure no member votes more than once while it is their turn at the box. In 1976 the BPOE had 1,611,139 members. Currently[when? ], it has 850,000 members. The Elks have traditionally been an all-male fraternal order. Unlike many other male orders, it has never had an official female auxiliary, after passing a resolution in 1907 that ruled "There shall be no branches or degrees of membership in the Order, nor any insurance or mutual features, nor shall there be other adjuncts of auxiliaries". [full citation needed] The Elks enforced this resolution through at least the 1970s. Nevertheless, several unofficial female auxiliaries were created: the Emblem Club, the Lady Elks and the Benevolent, Patriotic Order of Does. The Lady Elks appear only to exist on the local level and vary from place to place with regard to its activities. There also does not appear to be any published or printed ritual. 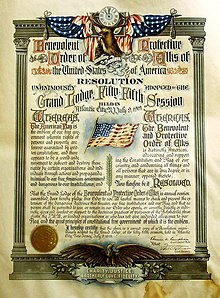 More organized are the Benevolent, Patriotic Order of Does who were chartered on February 12, 1921. This organization does have an organization above the local level, complete with districts, state organizations and a national "Grand Lodge". The Does also have a written secret ritual based on the Magnificat of Mary and which makes reference to St. Paul's First Epistle to the Corinthians Chapter 13, emphasizing love and charity. The Emblem Club was founded in 1926, with a ritual written by a male Elk. It also has a national organization with local Clubs, State Association and a national Supreme Club of the United States. In Beynon v. St. George-Dixie Lodge 1743 the Utah Supreme Court ruled that while Freedom of Association allowed the Elks to remain a men only organization, "the Elks may not avail itself of the benefits of a liquor license and the license's concomitant state regulation" as long as it violated the Utah State Civil Rights Act. Faced with losing their liquor licenses if they did not admit women, the Elks Lodges of Utah voted to become unisex in June 1993, which was followed by a vote at the Elks National Convention in July 1995  to remove the word "male" from the national membership requirements. No person shall be accepted as a member of this Order unless he be a white male citizen of the United States of America, of sound mind and body, of good character, not under the age of Twenty-one years, and a believer in God. Until 1973, the national constitution of the Elk lodge restricted membership to white men. In 1972, the Elks expelled the head of the Ridgewood lodge because of his advocacy against the Elk's racially discriminatory policies. A resolution to repeal the discriminatory clause passed in 1973 after failing at 3 previous national conventions. As of 1989, the organization was still almost entirely white. The rotunda displays mural and statues illustrating the Elks four cardinal virtues of charity, justice, brotherly love and fidelity. The friezes depict the "Triumphs of War" on one side and "Triumphs of Peace" on the other. The entrance is flanked by large bronze Elks. The BPOE is organized on five levels: the national or "grand" level, the regional level, the state level, the district level and the local lodge level. The highest level is the Grand Lodge, which meets in convention annually. The Grand Lodge elects all the officers of the order such as the Grand Exalted Ruler – the chief executive officer of the organization – Grand Secretary, Grand Esteemed Leading Knight, Grand Esteemed Loyal Knight, Grand Esteemed Lecturing Knight, Grand Treasurer, Grand Tiler (in charge of regalia), Grand Inner Guard and Grand Trustees. The three Knights assist the Grand Exalted Ruler and officiate in his absence; furthermore, the Grand Esteemed Loyal Knight acts a prosecutor in cases when an Elk is accused of an offense against the order. The Grand Trustee have general authority over assets and property owned by the order. The Grand Esquire is appointed by the Grand Exalted Ruler and organizes the Grand Lodges and serves as marshal of Elks parades. The Grand Chaplain is also appointed by the Grand Exalted Ruler. Frank Lewis Rain (1877-1941) from 1919 to 1920. John G. Price (1871-1930) Elected grand exalted ruler for 1924–25 at the Boston annual convention. Malcolm J. McPherson, Jr. (2017-2018). Elected Grand Exalted Ruler for 2017-2018 at the Reno Annual Convention. The state level organizations are called "State Associations"; state level officers include presidents, vice presidents, secretaries and treasurers. Local groups are called "Subordinate Lodges". Lodges officers are essentially the same as the ones on the national level, with "Grand" prefix removed. Lodges also may establish dinner and recreational clubs for members. In 1979 there were 2,200 lodges  Lodges which are incorporated are required to be governed by a board of directors. Otherwise the Lodge Trustees are the governing board. Like many other fraternal orders, the Elks at one point sponsored an insurance fund. The Elks Mutual Benefit Association was founded in 1878. At the 1885 Grand Lodge it was reported that the EMBA was prosperous, but its finances were carelessly managed. The Association was disbanded after the 1907 Grand Lodge passed a resolution banning mutual or insurance features, as well as degrees and auxiliaries. Despite its 1907 resolution banning any auxiliaries, the Elks at one point had a youth affiliate for young men called the Antlers. The first chapter was organized in February 1922 by San Francisco Lodge #3. The 1927 Grand Lodge approved the junior order, granting the Grand Exalted Ruler the power to permit subordinate lodges to instituted organizations for males under 21. In 1933 there were 45 local units of the Antlers with 3,584 members. However, the Antlers numbers were decimated during the Second World War, with so many young men going off to war. Despite 86 local Antlers groups still existing in 1946, the Grand Lodge deleted all reference to them in their constitution and bylaws that year. However, some local Antlers groups were still active in 1979, according to one source. Most Elks lodges operate a social quarters with a private bar. According to sociologists Alvin J. Schmidt and Nicholas Babchuk, members primarily joined the Elks to be "provided with entertainment, liquor, and food at reasonable rates" in the social quarters. Lodges are encouraged to participate in national Elks charity programs. There are also State Elks Associations charity programs. This usually includes a State Major Project. Elks Lodges are usually involved in other local charitable efforts. Established in 1928, the Elks National Foundation is the charitable arm of the BPOE. The foundation, with an endowment valued at more than $400 million, has contributed 455.4 million toward Elks' charitable projects nationwide. Since inception, the Elks have received more than $243.3 million in contributions and bequests. Today they boast more than 100,000 active donors and an endowment fund valued at $606.7 million. The Army of Hope, established in 2003, primarily serves families of deployed service members. 1919 Flag Day Resolution barring membership from people perceived as unpatriotic. The Elks have shown their devotion to Americanism by conducting bond drives, promoting civil defense programs and Flag Day observance. During World War II, they designated the week of March 15, 1942 "Win the War Week" and helped recruit for the United States Army Air Corps. An "Elks National Service Commission" was in operation from 1946 to 1950, and the Grand Lodge adopted a "Declaration of American Principles" in 1961 in Miami. CIP grants are only available to Elks Lodges. The Elks National Home is a retirement home in Bedford, Virginia built in 1916. In late 2013 the Elks sold the home to a private organization. The Elks originally borrowed a number of rituals, traditions, and regalia from the Freemasons. However, by the first decade of the twentieth century, much of this had been abandoned as the Elks sought to establish their own identity. The original two degrees required for membership were consolidated into one degree in 1890, the apron was discontinued in 1895, the secret password was gone in 1899, and the badges and secret handshake were abandoned by 1904. Initiation and funeral rituals still exist, however. The initiation rite is not considered a secret. The initiation involves an altar, with a Bible upon it and chaplain leading the brethren in prayers and psalms. The candidate must accept a "solemn and binding obligation" to never "reveal any of the confidential matters of the Order". He further promises to uphold the Constitution of the United States, protect brother Elks and their families, only support worthy candidates for admission and never bring political or sectarian questions up into the Order. The funeral rite is called the "Lodge of Sorrow" and also involves prayers. The communal burial ground and statue for Elks Lodge #315 at Greenlawn Memorial Park in Newport News, Virginia. The Elks have communal cemetery plots, often these are marked with impressive statuary. In Babbitt by Sinclair Lewis, a satire focusing on the banality of middle-class American life, the main character, George Babbitt, is an active member of the Elks. In East of Eden by John Steinbeck, it is mentioned that Adam is a member of both the Elks and the Masons. In The Blacker the Berry by Wallace Thurman, the character Alva and his landlord are both Elks. In Podkayne of Mars by Robert A. Heinlein, the title character's Great-Uncle Tom "hangs out at the Elks Club and plays pinochle" and is subsequently shown to be at the Elks Club many times later. Canadian indie rock group The Weakerthans have a song entitled "Psalm for the Elks Lodge Last Call". The song "Brotherhood of Man" in the musical How to Succeed in Business Without Really Trying mentions the Elks. In the 1985 film Back to the Future, the Hill Valley Elks Lodge is shown from inside the diner during 1955 sequences. A large Elks emblem is visible on the exterior of the building. In the "Homer the Great" episode of "The Simpsons", Abe Simpson says he is an Elk. In the episode "Two Bad Neighbors", former president George H.W. Bush visits the Springfield B.P.O.E. In Curb Your Enthusiasm, Larry David claims he's both "a Moose, and an Elk" to get into a mainly white Republican country club. In Faulkner's "A Rose for Emily," character Homer Barron is said to drink with "the young men at the Elks". In The West Wing episode entitled "The Women of Qumar" from Season 3, Sam Seaborn says, "My dad's an Elk." In the Rocko's Modern Life episode "An Elk for Heffer," Heffer Wolfe visits the O-Town Elks Club (literally a club for elks) by disguising himself as an elk. ^ a b c "Form 990: Return of Organization Exempt from Income Tax". Benevolent and Protective Order of Elks. Guidestar. May 31, 2014. ^ "Local Lodges". Benevolent and Protective Order of Elks. Accessed on March 18, 2016. ^ "Elks Founder Dies. J. M. Norcross, Minstrel, 84, Was Last Signer of Lodge Charter". The New York Times. March 1, 1925. Retrieved 2015-01-27. ^ a b Schmidt, Alvin J.; Babchuk, Nicholas (1973). "The Unbrotherly Brotherhood: Discrimination in Fraternal Orders". Phylon. 34 (3): 275–282. JSTOR 274186. ^ a b "Elks.org :: More Information". www.elks.org. ^ "Secret Ballot Box photo". ^ "Beynon v. St. George-Dixie Lodge 1743". ^ "ELKS MUST ADMIT WOMEN OR LOSE LIQUOR LICENSE". ^ "Elks Lodges Vote on Whether to Admit Women". ^ a b "New Test for Suits Seeking to Halt Governmental Support to Private Discriminating Organizations - Impermissible State Action". U. Colo. L. Rev. 44 (1973–1974): 447. ^ Meehan, Thomas. "The other July convention". The New York Times. ^ Kandell, Jonathan (1972-03-13). "Elks Dismiss Opponent Of Their All‐White Rule". The New York Times. ISSN 0362-4331. Retrieved 2019-02-13. ^ Pfefferkorn, Michael (1988). "The Ability of Voluntary Associations to Control Membership through Expulsion Comment". Saint Louis University Public Law Review. 7: 209. ^ Enstad, Frober (July 20, 1973). "Elks open source to blacks". Chicago Tribune. p. 12. ^ Fleeman, Michael (September 30, 1988). "Despite Reforms, Blacks Still Struggling to Join Elks Lodges". Associated Press. ^ "Elks.org :: History of the Elks National Memorial". www.elks.org. ^ "Welcome to the Elks Veterans Memorial". Benevolent and Protective Order of Elks. ^ "Elks Magazine Online". Benevolent and Protective Order of Elks. Retrieved October 17, 2008. ^ "Frank L. Rain". The New York Times. December 25, 1941. ^ "Veterans Services". Retrieved 3 July 2013. ^ "Journal Entries: Saint Peter's gets $100K grant from Provident Bank". NJ.com. September 22, 2015. Retrieved June 10, 2016. ^ United States Congressional Serial Set. U.S. Government Printing Office. 1914. p. 43. Retrieved 1 March 2018. ^ "Membership of the Louisiana House of Representatives, 1812–2012" (PDF). legis.la.gov. Archived from the original (PDF) on October 4, 2013. Retrieved July 8, 2013. ^ "Living Legends: Armand Brinkhaus". acadiamuseum.com. Retrieved May 23, 2014. ^ "Representative Dank, David, District 85". okhouse.gov. Archived from the original on January 2, 2015. Retrieved August 21, 2013. ^ "Gilbert Louis Dupre". St. Landry Trade Review. December 1896. Retrieved March 7, 2015. ^ http://www.elkshistory.org/ "April 1943 Elks Magazine reported that the Life membership card of Brother Eddie Rickenbacker was featured in several national weekly magazines. This was bestowed upon him by the LA Elks on June 18, 1919"
^ "Christian, John "Jack"". Louisiana Historical Association, A Dictionary of Louisiana Biography (lahistory.org). Archived from the original on February 25, 2012. Retrieved December 23, 2010. Wikimedia Commons has media related to Benevolent and Protective Order of Elks. A link to every State Association page.